While I’ve never formally studied psychology, I’ve certainly been a student of studying the mind for as long as I can remember. It’s such a huge topic and from what I have observed in life all of us at some point have experienced what it’s like when the mind gets out of control. Before I started meditating I thought I knew a thing or two about how the mind worked. Especially when it came to things like confidence, self-esteem, and love. Then, one day my life so called safe and secure life was literally shattered overnight. The result being that I found myself living in a constant state of panic and fear that I had no clue how to deal with. This is when I first became aware of my monkey mind. It was like I had a bunch of screeching monkeys in my head all running around panicking about some impending danger that they imagined was coming there way. The monkeys were my panic-stricken, negative, and fear-based thoughts. I felt totally powerless to turn off the noise in my head. This led to sleepless nights, anxiety filled days, and a rapid decline in my overall mental and physical health and well-being. I felt like I was a slave to some crazy creatures in my head that would not leave me alone. That’s when I became obsessed with finding out why the monkey mind had so much control over my quality of life and what I could do about it. That’s what eventually led me to meditation. The term monkey mind apparently was started by Buddha 2,500 years ago when he used it as a way to teach his students about how the mind worked and how they could use that knowledge to end the suffering it caused. Buddha went on to show his students how to meditate correctly to tame the monkey mind. He suggested that rather than fighting with the monkeys in the mind or trying to get rid of them that they are accepted and included as part of your meditation. When I first found out about this, it sounded a little strange to me as I just wanted them to shut up and stop ruining my life. However, as I was committed to doing whatever it took to gain some inner peace back in my life I was willing to give it a shot for at least 30 days in a row. By the end of the 30 days, I had my answer. It worked! It’s not that the screeching monkeys went away and I never heard from them again, it’s that my experience of those thoughts and the feelings that followed them changed. It’s exactly like when you stop arguing with someone and instead take a moment to look at things from their perspective. The moment the other person feels seen and heard, they instantly start to calm down. It’s the same with the mind. The moment you accept it for where it’s at with a non-judgmental attitude the monkeys start to get quieter. What also helps to tame the monkey mind while meditating is to focus your attention on something like your breath or a mantra. This allows you to develop the ability to be mindful of one-point of focus while lovingly accepting everything else that may be going on in your head, body, or the environment around you. 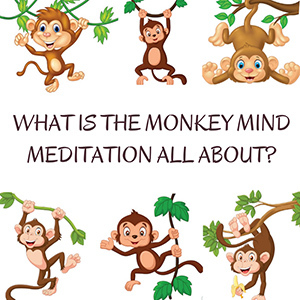 Learning to tame the monkey mind during meditation is a great way to help quiet the mind and enjoy more moments of calm and clarity. There are any number of simple mindfulness meditation techniques that will help to tame the fearful mind and free up your mental, physical, and emotional energy. https://www.meditationdojo.com/wp-content/uploads/2017/02/What-Is-The-Monkey-Mind-Meditation-All-About-Featured-Image.jpg 200 600 Michael Atma http://www.meditationdojo.com/wp-content/uploads/2017/01/Meditation-Dojo-2017-5-300x77.png Michael Atma2017-02-10 06:09:562017-02-10 07:37:11What Is The Monkey Mind Meditation All About?